Chocolate Truffles Assorted Flavors: Vanilla, Coffee, Cinnamon & More! Using our secret family recipe, these mouthwatering chocolate truffles are hand-rolled to achieve optimal creaminess and then enrobed in bittersweet, milk or white chocolate. Bittersweet version is Pareve/non-dairy. 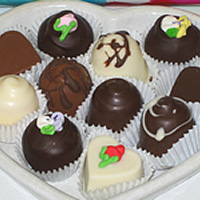 Choose from round truffles adorned with a sugar flower, dome truffles drizzled with chocolate, or heart truffles. Our vanilla, coffee and mint truffles get rave reviews! 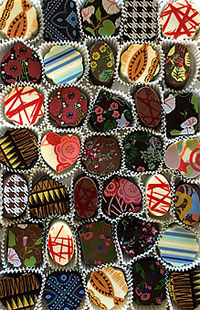 For something extra special, try our creative Designer Truffles. The heart truffles pair beautifully with our hand-dipped cashews for a wedding table centerpiece. Assorted, with bittersweet, milk & white chocolate. Half pound ($22), one pound ($36) and two pound ($72) boxes available. Designer truffles are also available in half pound ($23), one pound ($39) and two pound ($78) boxes. NOTE: 1) If the weather is warm or you are shipping to a warm location, please click here. 2) If you're not shipping your chocolates to your billing address, please provide an alternate address at the "Review your Order" page; simply click "Ship to" and enter the new address prior to submitting your order.